Many Sabres fans were sitting in front of their televisions, or on Twitter, waiting for a deal to be made. Surely some were losing patience, thinking Darcy Regier wasn’t going to make a single move. Just when the fans thought he couldn’t get any worse, he went out and acquired Cody Hodgson. And totally redeemed himself. Regier made one of his most surprising trade deadline moves over his entire tenure, sending Zack Kassian and Marc-Andre Gragnani to Vancouver in exchange for Cody Hodgson and Alexander Sulzer. It was a trade no one expected to see, but one that ultimately addressed the needs of the hockey team. Hodgson provides the Sabres with immediate help at center, a position at which they have very little depth. He is a top-ten talent, picked 10th overall in the 2008 draft – three spots ahead of Tyler Myers. Hodgson has a wide skill set and has respectable numbers (16+17) over 63 games this season. Those numbers were put up playing third line minutes behind the likes of Ryan Kesler and the Sedins. For those who aren’t familiar with Hodgson, he was a major player on the 2009 Canadian junior team that took gold in Ottawa. He has the potential to be a number one center, but certainly qualifies as a 2A at the very least. Looking at Buffalo’s centers before and after this trade, it is obvious Regier knew he needed to make a move to shore up more top-end talent at center. Hodgson addresses this need today and for the future. 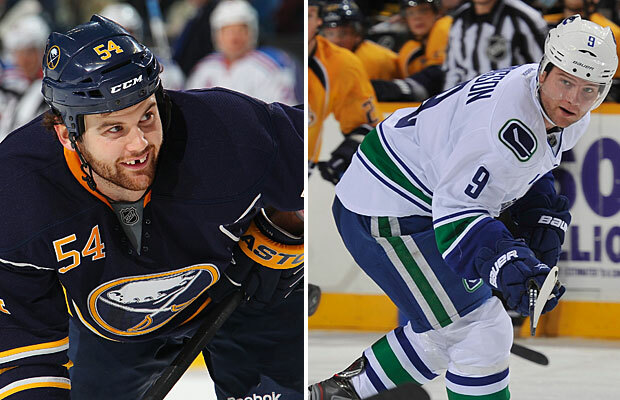 Giving up Zack Kassian is going to be a very tough pill to swallow for a number of Sabres fans. He was drafted with the hopes of providing a gritty, talented winger for the Sabres to ride for years to come. While his physical game seemed to wane on a game-to-game basis, the offensive chops appeared to be growing. However, finding a physical winger who can hit and score is far easier than finding a true talent at center. Whether Marcus Foligno is actually the player the Sabres expect to fill Kassian’s role is unknown, but obviously they’re aware that the drop between Kassian and Foligno is less than not having a center of Hodgson’s skill level. The only loss the Sabres will suffer will be seen over the last 20 games. The absence of Kassian – despite his random displays of physicality – and Paul Gaustad make the Sabres a smaller, less physical bunch than they already were. The trade for Paul Gaustad was great. They received the return they expected for him, while only needing to sweeten the pot with a fourth-round selection. The goal must be to re-sign Gaustad on July 1. In the event they lose out on him, they still have some return to show for him. Without Gaustad, the Sabres defensive zone just got a little softer. The penalty kill will suffer and faceoffs will likely drop a bit. Derek Roy will be counted on to fill his role in a defensive sense. Obviously there isn’t any immediate help on the roster in the size and grit category. I’d say Cody McCormick could offer some of that jam, but his concussion issues make me think this is a lost season for him. Still, snagging a first round pick for Gaustad was a huge coup for Regier. It guarantees him four picks in the top 40 or 50 selections in June’s draft. Buffalo’s potential lottery pick could be a player to step directly into the line up, those other three picks could be no further than two seasons away from a professional contract. That is a tremendous position to be in for the team as a whole. This deadline was a victory for Regier, without a doubt. Hodgson fills a major void and makes the top-six more skilled. Sulzer will end up being a wash, but opens space for some young talent next season. The first round selection from Nashville will be useful and there is still the chance of bringing Gaustad back. Regier addressed his team’s needs and addressed them with a highly skilled player. He has set himself up well to enter the offseason with some strong momentum towards building this roster into a winner. There isn’t much to complain about after the job Darcy Regier did today. Sabres fans should be happy with where the team is today and where they are headed in the near future. Previous Article Deadline Primer: What direction should the Sabres take?